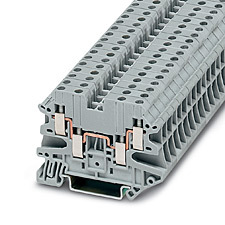 The XBUT D multi-conductor terminal blocks offer a space-saving alternative to standard feedthrough terminal blocks allowing for high density wiring. Often, three connections have to be led to one terminal block. The XBUT D12 terminal block accomplishes this without any additional terminal blocks or bridging required. The XBUT D22 terminal blocks allow four wires to be connected to one potential and can therefore be used as compact power distributors.